"This is one great tasting salad I enjoy making one time a year: when the blueberries are in season. It's pretty much the only thing I make with blueberries, since they are expensive. A pretty colored salad! This is a great salad to have for the 4th of July." In a medium bowl, whisk together the gelatin mix, sugar, lime juice, and boiling water for one minute, or until the gelatin is completely dissolved. Cover, and chill for one hour, or until slightly thickened. When the gelatin mixture is thick, whip with a whisk or electric mixer until light in color, and double in volume. Whisk in whipped topping, and fold in blueberries. Lightly grease a 5 or 6 cup gelatin mold, and fill with the gelatin mixture. Chill for 4 hours, or until firm. Carefully unmold onto a platter, and serve. 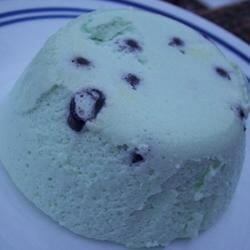 Very good I used mix berrys in the Jello Mold Made the day before. I have made this several times and it is always a huge hit when I take it places! It is so refreshing and we LOVE it!